Gather 'Round Soul Restoration retreat is designed especially for YOU! Disconnect from social media and the seemingly endless “to do” list to give yourself time to relax, recharge your “batteries,” and reconnect with what matters to you. Soul Restoration is an amazing curriculum designed to help you re-unite with your inner "Truth Teller," remind you of your gifts and talents & help you identify the lies that hold you back and make you feel less than. It is intended to enable you to find and keep the bravery needed to stay true to your own path. You'll leave with a new set of skills & beautiful tools to use for the rest of your life. Made popular by Brave Living, formerly known as Brave Girls Club, Soul Restoration has been completed and LOVED by thousands of women around the world and is now available here, in the Midwest! 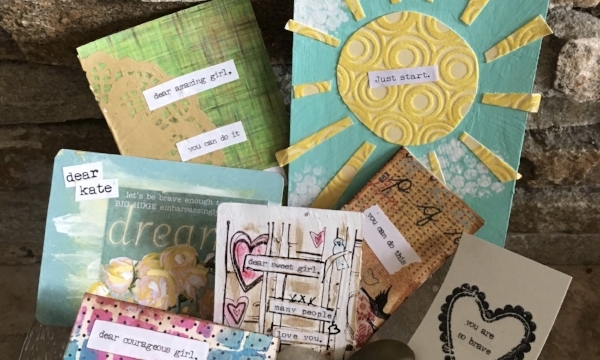 You'll gather in a circle of sisterhood for 3 all-inclusive days of pampering, delicious food, and easy, yet meaningful art projects. You'll leave feeling refreshed, refocused and deeply loved. All supplies; workbooks, journals and special goodies are provided. Free time will be spent in the art space, going for walks, yoga/meditation, reading a book or visiting with your new friends. Join us for this magical experience! To save yourself a spot, click the button below.